Preheat oven to 325 degrees F. Cut small slits in the lamb and insert garlic pieces into the slits. Combine olive oil, mustard, salt, pepper, rosemary and thyme and rub thoroughly over and into the meat. Place the lamb on a rack in a roasting pan and place in oven uncovered. 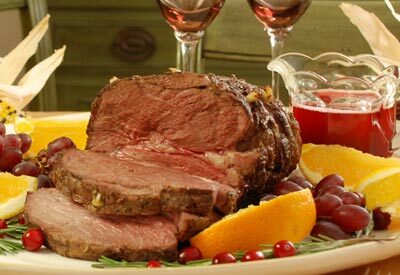 Roast for 20 to 25 minutes per pound (approximately 1 3/4 hours). Remove kitchen string and slice into 1/2 thick slices against the grain of the meat. Serve with Cranberry Gravy if desired. In a covered saucepan cook cranberries and sugar over moderately low heat, stirring frequently, until sugar is melted and cranberries burst. In batches, puree cranberry mixture in a blender until smooth and transfer to a bowl. Cranberry mixture may be make 1 day ahead and covered and chilled. Bring mixture to room temperature before continuing with the preparation. Skim fat from pan juices, reserving 3 tablespoons fat, and deglaze pan with water over moderately high heat, scraping up brown bits. Simmer pan juices 3 minutes, stirring. Remove from heat and set aside. In a saucepan whisk together reserved fat and flour and cook mixture over moderately low heat, whisking for about 3 minutes. Add pan juices and broth slowly; whisk. Add cranberry mixture and continue to whisk. Boil gravy, whisking occasionally, until reduced to about 5 cups. This will take 15 to 20 minutes. Strain through a sieve into a saucepan. Season gravy with salt and pepper and serve warm.